These 26 short articles provide — in alphabetical order — a terrific introduction to planning in America. They were prepared for the Planning Commissioners Journal by planning historian Laurence C. Gerckens, FAICP. Gerckens is national historian for the American Institute of Certified Planners; founder of The Society for American City and Regional Planning History; and emeritus professor at The Ohio State University. 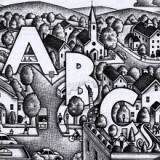 Paul Hoffman, who illustrated all 86 covers of the Planning Commissioners Journal, prepared the 26 illustrations for the Planning ABC’s. Sit back, relax, and browse through a range of fascinating planning topics. A community’s comprehensive plan is not just a file cabinet full of plans for future streets; parks and recreation; housing; and so on. More importantly, it is an integrated statement of the aspirations of the community designed to achieve a broad array of community objectives. Urban designers established the foundations of American community and regional planning in the second half of the 19th century, and early 20th century. Their visions of a more ideal America kindled efforts that were realized in the community comprehensive plan and in other ways. A look at the increasing breadth of the historic preservation movement as it evolved from the 1920s concern about preserving buildings associated with famous Americans, to today’s recognition of the link between historic preservation and economic development. What might be termed the “classic” planning process, as developed in the early decades of the 20th century, followed three sequential steps: (1) data gathering; (2) plan making; and (3) plan implementation. This “classic” planning approach, however, was critically flawed in two ways. Land ownership and subdivision in America has long been subject to detailed legal requirements and procedures. A look at some of the most significant changes over the past two centuries.